Should you visit Drogheda? To be fair, at a first glance, the twin north of Dublin is not really much to write home about. But then again, churches, Georgian architecture, a splendid medieval town gate, and the head of St. Oliver Plunkett might make a short visit well worth your while. Drogheda straddles the mouth of the Boyne and is the southernmost town in County Louth. Part of Drogheda was once in County Meath. Long known as a bottleneck on the road from Dublin to Belfast, it is now bypassed via the Boyne bridge and the M1, a connection locals might wish to have existed in Cromwell's time. Drogheda is an industrial center and has a (though not immediately obvious) port that once contributed to the town's prosperity, but now is in a not very picturesque state. The latter might be said for many areas of the town center, as fine Georgian buildings are often allowed to fall into disrepair, right next to new commercial developments. Medieval ruins are crowded by nondescript vernacular buildings. Walking through Drogheda, especially on a gray, rainy day, can be something of a slightly depressing experience. But there are some highlights that make visiting the town worthwhile to those willing to seek them out. Drogheda's name is derived from the Irish "Droichead Átha", literally "bridge at the ford," a name that encapsulates the reason for the settlement. There was a ford, and later a bridge, that formed part of the main North-South route on the East coast. It was a place for trade and defense. No wonder that two towns sprung up: Drogheda-in-Meath and Drogheda-in-Oriel. Finally, in 1412, the two Droghedas became one "County of the Town of Drogheda." In 1898, the town, still retaining some independence, became part of County Louth. During the middle ages, Drogheda as a walled town formed an important part of the "pale", and also played host to the Irish Parliament at times. Being strategically important practically guaranteed a not so peaceful existence, and the town was indeed besieged several times. The most infamous siege ended with Oliver Cromwell taking Drogheda in September 1649. What happened next is deeply ingrained into the collective Irish psyche: Cromwell's massacre of the Royalist garrison and Drogheda's civilian population. The exact facts surrounding this atrocity are still disputed. During the Williamite Wars, Drogheda was well defended and King Williams troops fatefully decided to by-pass it, instead fording the Boyne at Oldbridge. The Battle of the Boyne in 1690 is still one of Ireland's most important events in history. 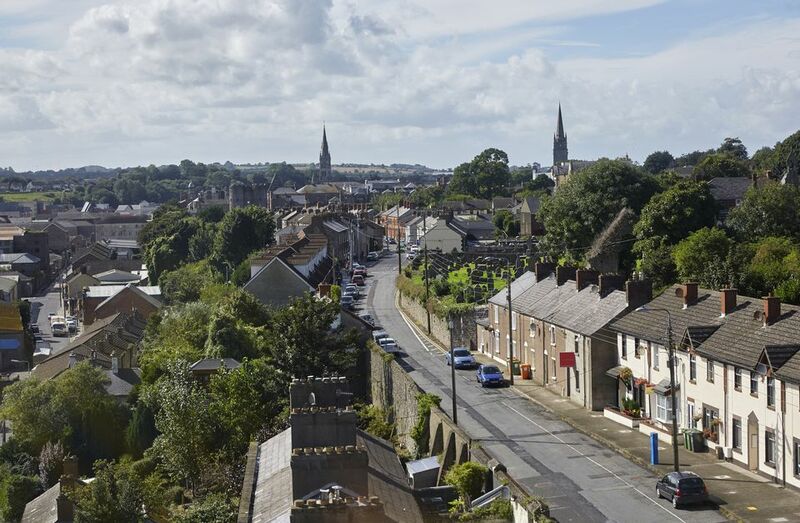 During the 19th century, Drogheda reinvented itself as a commercial and industrial center. From 1825, the "Drogheda Steam Packet Company" provided a maritime link to Liverpool. The town's motto "God Our Strength, Merchandise Our Glory" said it all, though the 20th century saw a slight decline in fortunes. The town still retained some industry and the service sector replaced others. A large influx of inhabitants came during the "Celtic Tiger" years when Drogheda suddenly formed part of the commuter belt for Dublin. St. Laurence's Gate (corner of Laurence Street and Palace Street) is an almost complete part of the medieval town wall and still imposing. Traffic flows through it though and the built-up surroundings somehow detract from the gate. From here, you are still able to trace the town's former boundaries by following the roads that replaced the ramparts. St. Mary Magdalen's Tower (between Magdalen Street Upper and Patrick Street) is all that remains of the friary of that name on one of the highest points in the town, a splendid medieval belfry. St. Peter's Church (Church of Ireland, Peter Street) is interesting for its churchyard. Set in a wall behind the church, you will find a medieval grave slab that depicts the departed as skeletons barely dressed in funeral sheets. This realistic image, serving as a memento mori for those left behind, was in vogue for a short period and contrasts with the more sumptuous imagery and more conventional medieval graves. St. Peter's Church (Roman-Catholic, West Street) is a huge Catholic church right in the town center and a place of pilgrimage. Here the head of St. Oliver Plunkett can be seen. In a shrine behind glass, the somehow shriveled countenance of Ireland's latest saint is not a pretty sight. A small exhibition also informs visitors of St. Oliver Plunkett's martyrdom at the hands of the English. The still impressive Tholsel, the old town hall, can be found on the corner of West Street and Shop Street. The Millmount Museum in Barrack Street on the site of a former castle, the museum towers over Drogheda, albeit from the far (southern) side of the river. The exhibitions on local history and industry are worth a visit. Visitors interested in railway history should visit the Irish Rail station (some old buildings just off the Dublin Road) and have a look at the impressive Boyne Viaduct. Drogheda United is one of the more notable soccer teams in Ireland, winning several trophies. Their home ground can be found in Windmill Road. Local myth perpetuates the story that star and crescent were added to the town arms because the Ottoman Empire dispatched ships with food to Drogheda during the great famine. Unfortunately, no historical records support this and the symbols also pre-date the famine.